In Twin Tin Bots many corporations have invested in crystal mining after they were discovered as a potent energy source. They designed and improved robots to harvest crystals and a few people can now run a big crystal harvesting rig. Many teams work on the same harvesting plant, but the game’s always on to bring more crystals back than the others. The player who harvests the most valuable crystals wins. The game is played on a hexagonal grid. 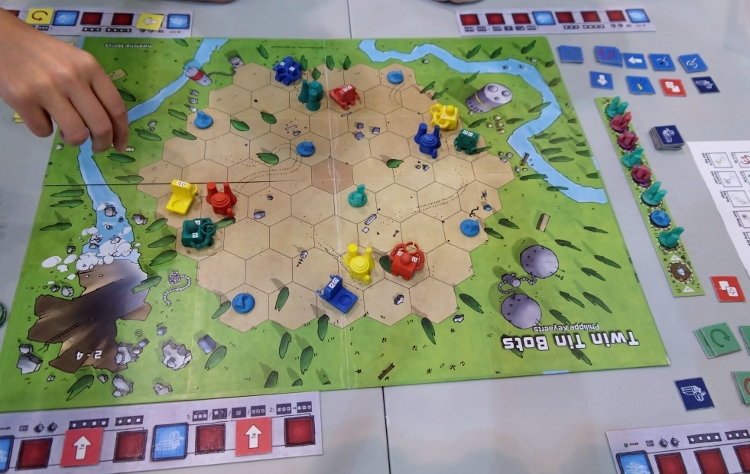 Each player receives two robots and a command base. These are placed in specific positions on the grid. A number of crystals is also placed in specific positions on the grid. The crystals come in three colours: blue, green and pink. Blue crystals are worth 2 points, green crystals are worth 3 points and pink crystals are worth 4 points. On the first turn of the game, you can play an order tile on one of each of your robots’ program, and then execute it. You use simple orders (forward, turn, harvest, unload, …) but there are two robots to control, and only one order can be changed each turn!On subsequent turns however you may only make one change to the programming. On each turn, you can make a single program change, and then you must always run the program of both your robots, in sequence from left to right. Even though it only allows one action per turn this clever system makes it possible to build a complex program over time. Each robot has 3 program slots available. The mechanics are easy to understand, however, in practice it is likely to become more difficult to execute the tactics envisioned, so the more advanced players will enjoy. Serious challenges since round two at a time to control character, so that the program can be scheduled at a time to change some parts. You will only need a few turns to grasp Twin Tin Bots, and it is simple enough that children from 10 and up can play it. The game plays in under 60 minutes, even with 6 players. The player turns are very simple so game rounds are short and there is no downtime. Current price about 40 USD.